The current Museum of Art/WSU is closing its doors after 42 years of dedicated service to the arts. We will reopen with a new name, the Jordan Schnitzer Museum of Art/WSU, in a newly completed building on Mom’s weekend 2018. 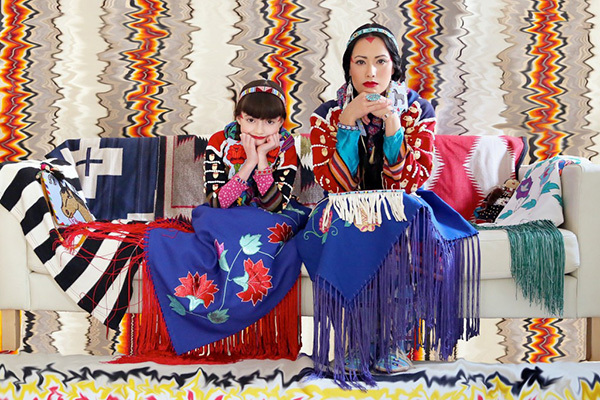 Join us for a closing reception party and special lecture by Wendy Red Star and her ten year old daughter, Beatrice Red Star Fletcher from 5-7 pm on November 17, 2017, in the current gallery space. Through incorporating a variety of media in her practice, Wendy Red Star uses her art as a response to address the widespread misrepresentation of Native Americans in popular culture and examine the intersection between colonialist structures and Native American beliefs. Historic photographs like those of photographer, Edward Curtis, misrepresented Native culture by over-romanticizing Native Americans from a white perspective, which is still apparent in modern mainstream culture in the form of sports mascots or sexualized costumes. Humor and surrealism become a vehicle for Red Star as she investigates Crow culture in her work, which is simultaneously critical and celebratory—a tool for “decolonizing the way people are seeing things.” Born in Billings, Montana in 1981, Wendy Red Star was raised on the Apsáalooke (Crow) reservation in southeastern Montana. Red Star received her BFA in sculpture from Montana State University and an MFA from the University of California, Los Angeles.